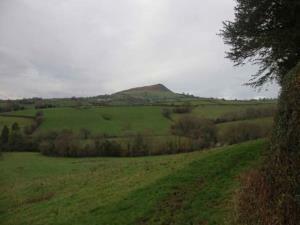 26 Llanvetherine to Llangattock Lingoed at Abergavenny to Skenfrith layby01633 644850work Walking RouteThe route starts out along a section of the Offa’s Dyke Path which is well marked with the National Trail acorn symbol. On reaching the church at Llangattock Lingoed you leave Offa’s Dyke and head across undulating farmland, through Tump farm to the lane beyond. A series of quiet and green lanes return you to Llanvetherine. The track beyond Whitehouse can be very wet – if this is a problem an alternative ‘hollow lane’ runs past Winston Court to join the main road at Llanvetherine. The route starts out along a section of the Offa’s Dyke Path which is well marked with the National Trail acorn symbol. On reaching the church at Llangattock Lingoed you leave Offa’s Dyke and head across undulating farmland, through Tump farm to the lane beyond. A series of quiet and green lanes return you to Llanvetherine. The track beyond Whitehouse can be very wet – if this is a problem an alternative ‘hollow lane’ runs past Winston Court to join the main road at Llanvetherine. Points of interest include the uninhabited Little Pool Hall (a medieval farm), the Old Court and the church of St. Cadoc at Llangattock Lingoed.